In this post, I will be sharing with you two of our favorite food adventures in Zanzibar, otherwise known as the “Spice Islands”. This semi-autonomous chain of islands has an intriguing history and culture of its own. 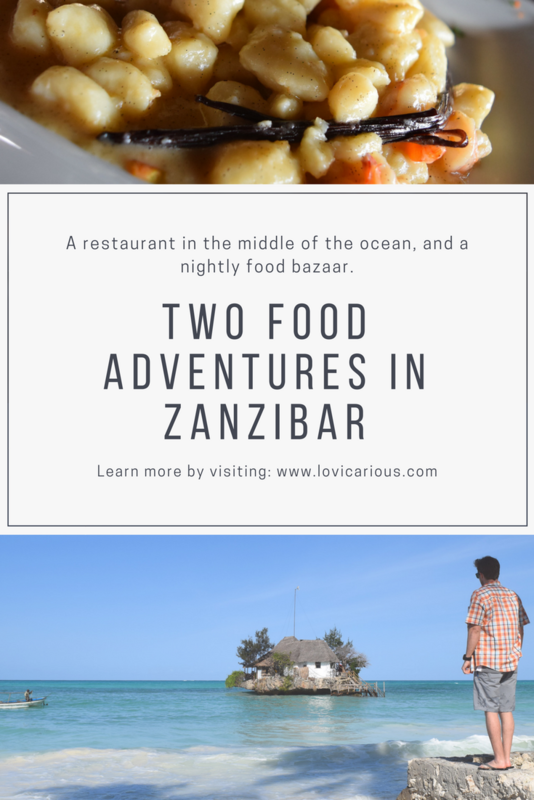 While I could go on about Zanzibar’s charming towns, the beautiful beaches, the traditions, and those adorable red colobus monkeys, I am here to talk about food. So let’s get to it! Stepping off the transit ferry from Dar es Salaam, we entered the historic city and entry port to Zanzibar. Stone Town is a World Heritage Site known for its rich cultural heritage and influences from Arab, Persia, Indian, and European. This is evident as you make your way through the Morrocan-like labyrinth of narrow corridors, and man are they difficult to navigate! After a 45 minute detour (aka getting lost), we finally found which of the giant wooden doors belonged to our AirBNB host. We settled in, chatted with our host for a bit, and when night had fallen, we decided it was time to eat. Upon several recommendations from other travel bloggers and our own host, we learned that Fordhani Gardens is a culinary and cultural experience not to miss. With a bit of hesitancy, we re-entered the labyrinth of streets below in search of this so-called “easy to find” place. Luckily, there was a steady stream of people flowing through the streets, all heading toward the same direction. We joined right in and followed the crowd. A few turns later, the cooridors opened up to a large public garden filled with people, lights, and the unmistakeable aroma of delicious street food. Children were running around with their friends. Chefs were busy cooking over hot grills. Fresh meats and seafood were sizzling. Aromatic smoke from the grill was floating up and filling the garden. There were at least 50 private stands with chefs enticing you with their smiles and specialty dishes. Many had elaborate displays of everything under the sun to include octopus, crab, lobster, oversized sausages, grilled corn, skewered chicken, and spiced lamb; some served fried delights and the traditional Urojo Soup (Zanzibar mix); and finally a few stands toward the front offered Zanzibar pizza. Don’t know what that unidentifiable fried ball is or that strangely colored meat on a stick? Go ahead and ask! Each chef, and I mean each and every chef, was ready and eager to explain his offerings. It brought such a smile to my face to hear the kind enthusiasm in their words. With the pocket-friendly prices, we ended up filling our plates with a bit of everything. The octopus was delicious, and the Urojo Soup was a uniquely tasty experience. Of the mounds of food we ate, the hands down show stealer was the Zanzibar pizza. Think of a blend of minced meat and savory spices, wrapped into a delicate crepe, then thrown onto the grill for a nice golden crisp. We tried a dozen different items, but Zanzibar pizza from Fordhani Gardens is the one thing I will always remember Zanzibar by. If someone can find a good authentic recipe, please send it to me immediately! If you are spending the night in Stone Town, a trip to Fordhani Gardens is a must. This place is just a smorgasbord of new and interesting foods, perfect for the adventurous eater. It is also a wonderful mashup of locals and tourists mingling together in one location, bonding over food and culture. Before arriving in Zanzibar, this landmark restaurant was already on our list. Known for its unique ambiance and picturesque location, we knew we had to experience it for ourselves. We took a dala-dala, an open-air truck with seats in the back, from our treehouse bungalow in Bwejuu to the Rock Restaurant in Paje. We pulled up to the shoreline, and there it was. Imagine in the distance, a charming little white cottage covered by a thatched roof, and perched high up on a jagged rock. A soft breeze is passing, carrying with it the perfume of sweet and savory spices. You are starving and it is just calling to you. The only thing separating you from whatever deliciousness is being prepared in that tiny restaurant is….a 20m stretch of the Indian Ocean. Welcome to The Rock. Although we were prepared to swim to our destination and work for the many calories we were about to consume, we were pleasantly surprised and quite relieved to find a small fishing boat wading in the shallow water. This optional boat service is provided complimentary by the restaurant for those not brave enough to swim. Now while I am in peak athletic condition with no fear and unabounding energy levels (yeah right), I was quick to take that boat option. As our “captain” held the boat steady, we delightfully said “mambo!” and hopped in. Dipping my fingers into the turquoise water as we drifted along, I watched as we approached the Rock. 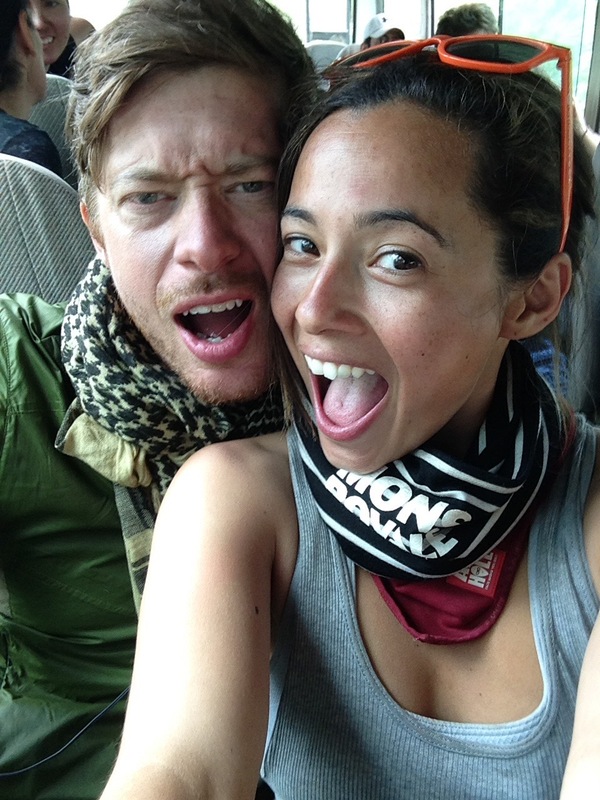 En route to The Rock Restaurant, Zanzibar. Pulling up to the tiny little island, we stepped out of the boat, onto the rickety wooden steps and into the main entrance. We were warmly greeted by the owner who showed us to the back patio where we could enjoy a cocktail and the sunset over the Indian Ocean as we waited on our table. 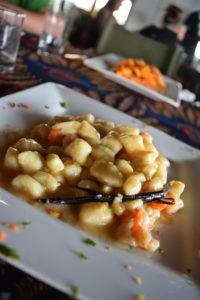 Freshly made Gnocci from The Rock Restaurant, Zanzibar. Reviews for food at the Rock have been mixed. Generally, people mention that the food is quite pricey and that the quality of food is sub-par for the price. I will agree that the menu does not have “local” prices, however, I thought my dish was spectacular. The potato gnocchi was served with grilled prawns and a delicate sauce made from Zanzibar vanilla. It was not too heavy and perfectly seasoned. Delicious. Finishing our last cocktail, we headed out the front door to find that it was now low tide. We climbed down the same rickety wooden stairs, with one big leap at the bottom to land on the now exposed ocean floor. Guided by the light of the full moon, we walked back to find the next dala-dala. Although the Rock is without-a-doubt one of the pricier options in Zanzibar ($20 – $62), I think that the sheer uniqueness of the location and experience is what you are paying for. I have spent more on a steak that I don’t even remember. To me, the Rock is certainly worth the trip and the price. 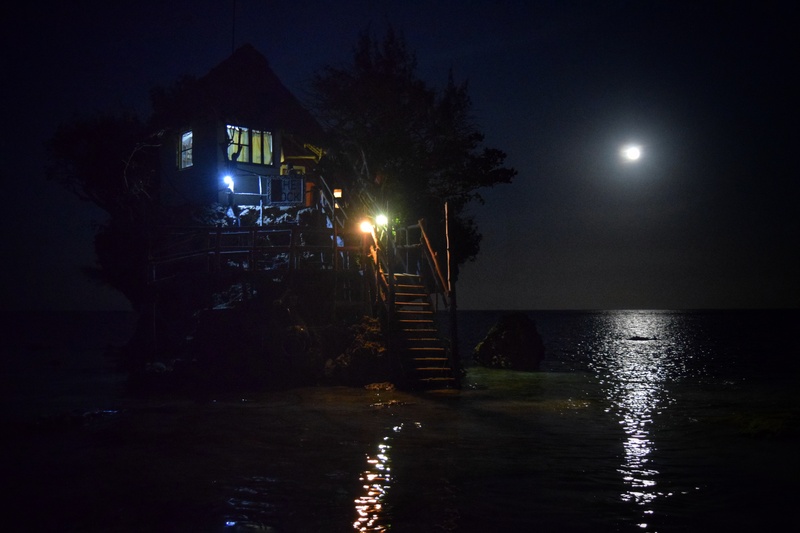 The Rock Restaurant at night. I said two food adventures, but I am going to throw this one in for free just because. Should you ever find yourself in Zanzibar, do yourself a favor and try a “Spice coffee” from Stone Town Cafe. Their rendition of the fresh brew is just running over with the right hints of cinnamon, nutmeg, cardamom, and ginger. It is an incredible experience both for your nose and for your taste buds. Longing for that taste again, we have tried to recreate this liquid gold in our french press at least 5 times, each time was a miserable failure resulting in what tasted like burned dirt covered in cinnamon. Although I wouldn’t quite categorize this as an “adventure” per se, Stone Town Café’s “Spice Coffee” is just that good and I wanted to share it with you.